We are manufacturers of Diamond Woven Wire Mesh with over 1,000 years of combined experience and the longest history in the INDUSTRY! STAMPED for quality work-manship and ethical business standards, woven wire mesh products are designed for institutional, industrial and even architectural applications. Woven Wire… an essential part of almost every industry. The first woven wire fence was developed in 1889 and woven wire has become a staple in business and industry over the past 125 years. From its many applications to its quick and simple installation, Woven wire products are cost effective, they include storage lockers and computer cages to barriers, enclosures and partitions, as well as protect valuable assets and inventory. 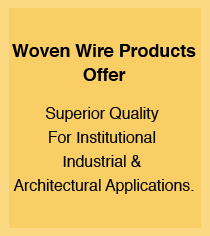 Woven wire products are cost effective. By producing a woven wire mesh at higher volumes, WWPA members are able to pass the savings along to you. The open diamond mesh pattern also allows for proper ventilation and visibility. The interwoven design not onlyprovides additional strength, but this design has been an industry standard for 60 + years. Sign up to receive the latest WWPA updates and products.